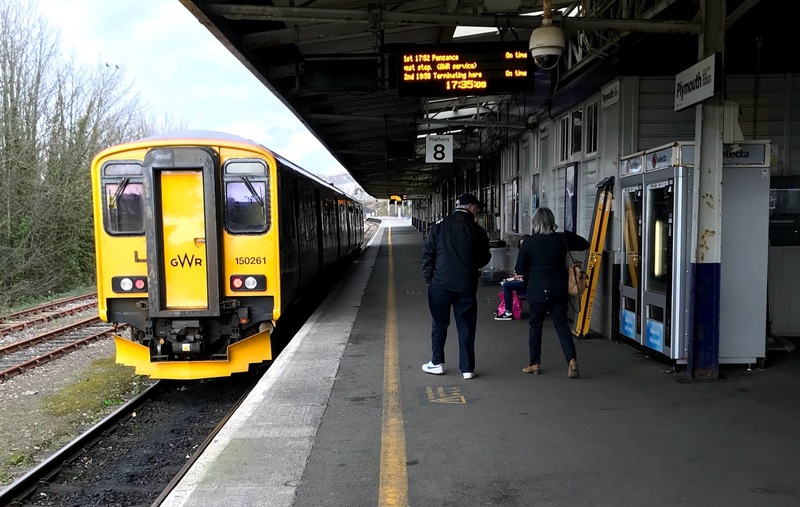 Finding myself in Plymouth over the Easter weekend, I took the opportunity to do something I have been wanting to do for ages – embark or disembark at all the stations in Plymouth. These days, in this denuded railway age, there are 6 stations: Plymouth, Devonport, Dockyard, Keyham, St Budeaux Ferry Road and St Budeaux Victoria Road. 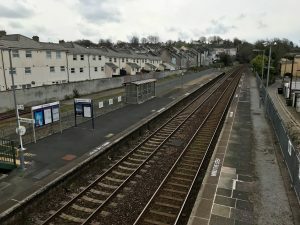 Of course, there used to be many more stations in Plymouth. Wikipedia lists 29, although some of these are outside my mental map of what counts as Plymouth. Nevertheless, that leaves ample opportunity to seek out remains and remnants in the future – perhaps following in the footsteps of Hidden Plymouth. 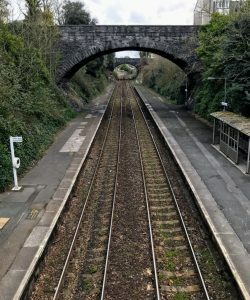 Even in my own lifetime, some very impressive pieces of railway infrastructure have gone – such as the Ford Viaduct which was demolished in the 1980s. In theory, I should remember it but I don’t. I started on a Saturday evening by taking a train from Plymouth station itself to St Budeaux Ferry Road. 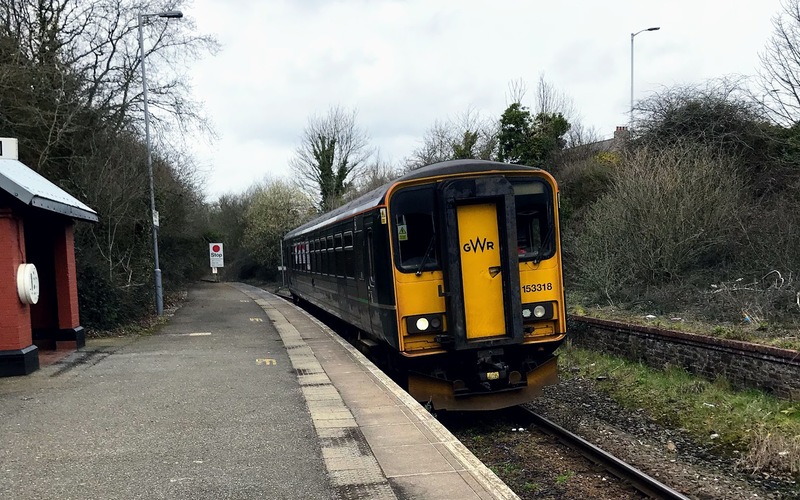 Not many services stop at St Budeaux Ferry Road – 4 a day each way on a weekday, 2 on a Saturday and only 1 on a Sunday. This station is on the main line between Plymouth and Penzance, and the services to and from this station are the stoppers which service this route. There isn’t much to say about the station itself – 2 platforms, reached by taking the road bridge. 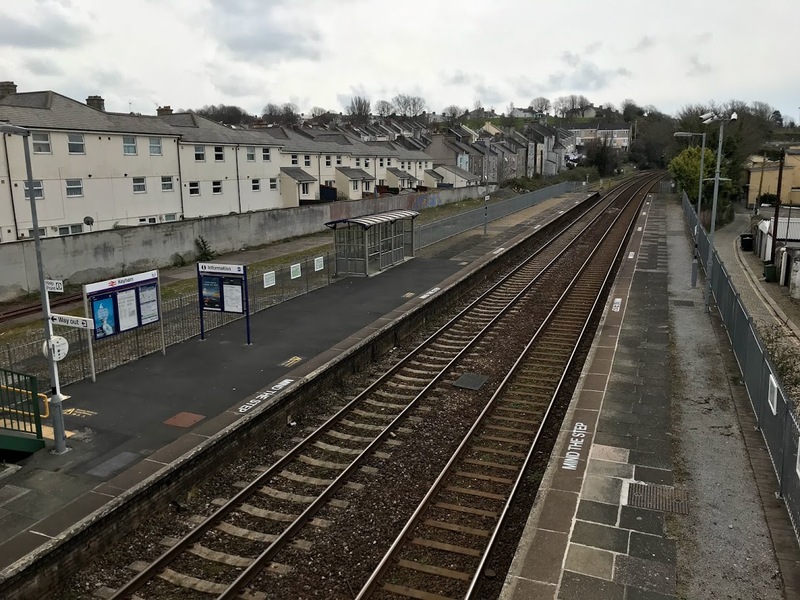 This is the least used Plymouth Station – 3976 entries and exits in 2016-17 (so about 11 a day). This is not surprising given the low level of service. 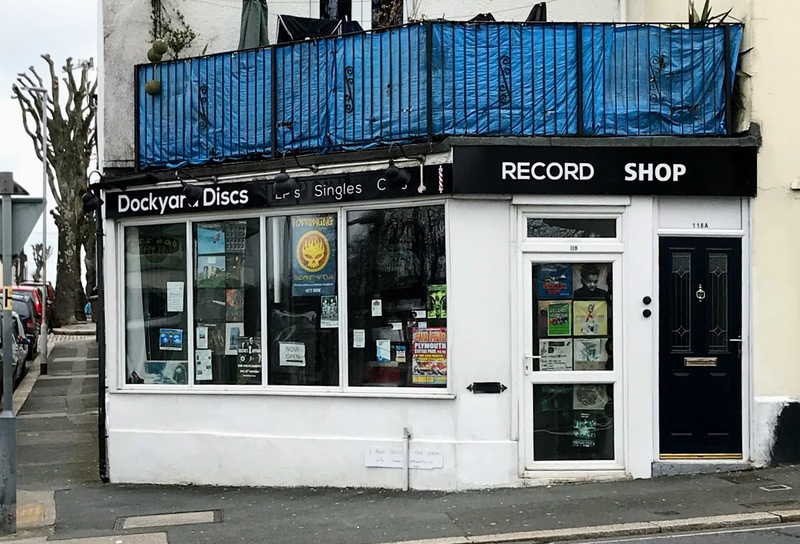 The next day (Easter Sunday itself) I walked along Wolseley road from my in-laws house to the other St Budeaux station – St Budeaux Victoria Road. 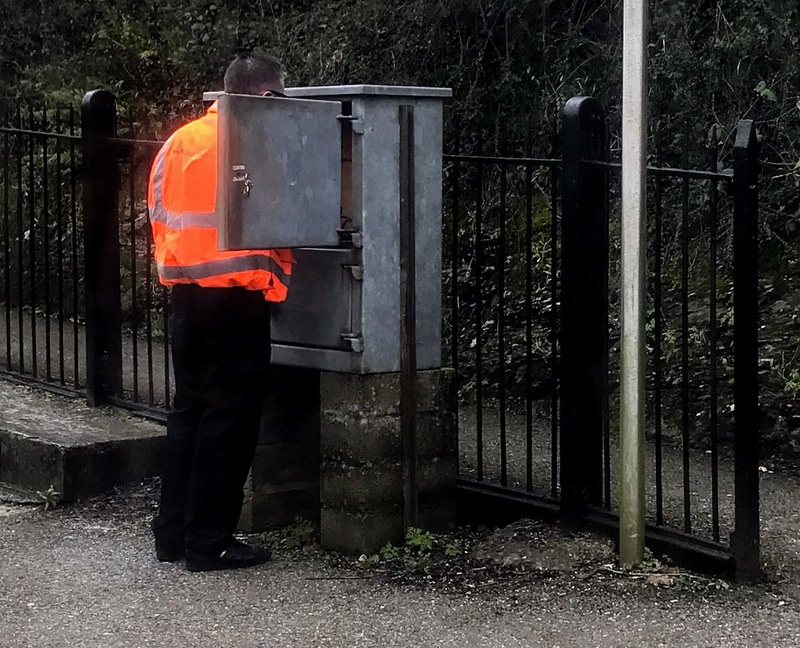 This is literally across the road from Ferry Road, but is the first stop on the Tamar Valley Line between Plymouth and Gunnislake. These days the Tamar Valley Line is single track, but there is a long disused second platform here – a remnant of when this formed part of the route into Plymouth from London via Okehampton. 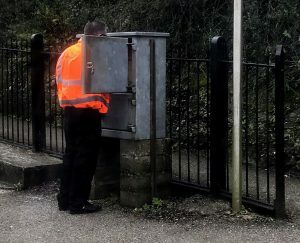 The other consequence of the single track running is that the driver has to leave the train here to either pick up or replace a physical token stored in a secure cabinet on the platform. Without the token, the train is not allowed to proceed onto the line. The journey to Devonport station does not take long. The guard seemed rather surprised by my ticket – yes, I am geeky enough to want a ticket naming each of the stations I visit. Devonport station was my local station when I lived in Plymouth, but I rarely used it. 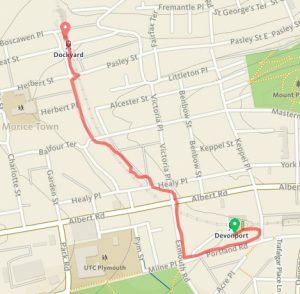 Next step was to stroll between Devonport and Dockyard stations – not a very long walk, but it took me along streets that I haven’t had cause to visit for many many years. 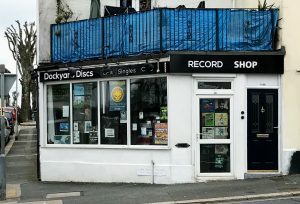 Much to my delight I discovered a new (to me at least) record shop on Albert Road – Dockyard Discs. I will definitely be paying a visit next time I am down. 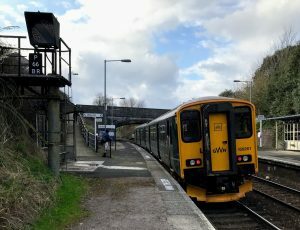 Dockyard station is the smallest of the Plymouth Stations. It is also a request stop, which is always exciting. Much to my surprise, there was someone else waiting. We both stuck our arms out. The guard by now I think had twigged what I was up to and gave me a wry smile. I got a slightly sarcastic wave when I got off again about 1 minute later at Keyham! 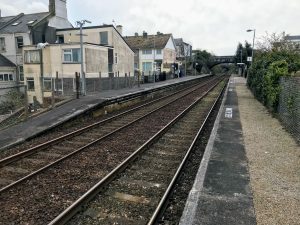 Keyham is a much larger station than seems necessary these days, with two long platforms linked by a substantial footbridge, which leads all the way out via the houses on Admiralty Street. The footbridge passes over what used to be the marshalling yard, which still contains one siding. It looks like it is occasionally used – presumably in relation to the branch in to the dockyard which is just around the corner. There are occasional nuclear waste trains in and out which I would like to catch one of these days. And that was it! Just a short walk home. All the Plymouth Stations visited (and named tickets stuck in the scrapbook).